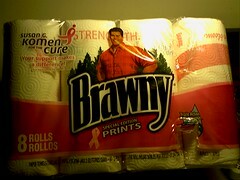 Check out this great deal: a pack of eight rolls of Brawny paper towels for only $5.00! At Smith’s Food and Drug in the Marketplace on Saturday, April 28, 2007.
ooooh…. I’m all over that one.. So your going to go into advertising after retirment 🙂 You’d do good at that…. The items change and rotate their position on the page. About a week ago, I could get a free sample of Dial Antibacterial Deodorant Soap, Secret Clinical Strength Antiperspirant, Advil PM, among other items.